This is my mother’s recipe for homemade yogurt. I made her recipe so many times. She probably took it from the yogurt maker which is a Yogourtmet. It’s very old like I said the other day. Sorry for the bad photo. I don’t have cute bowl 😦 I really should buy some cute bowls very soon. Pour 1/2 cup of milk in a small measuring cup. Sprinkle the gelatin. Stir just a little bit. Set aside. Pour the remaining milk in a large saucepan. Heat at medium heat, always stirring, until milk is 180F (you can use a candy thermometer). When the milk is 180F, remove from the heat. Take some of the hot milk and add it to the mixture of milk and gelatin. Stir well. Put this mixture in the saucepan with the milk. Stir. Allow the milk to cool to lukewarm-110°F To speed up the process you can place the pan in cold water. When the milk is 100F, you can remove it from the water. 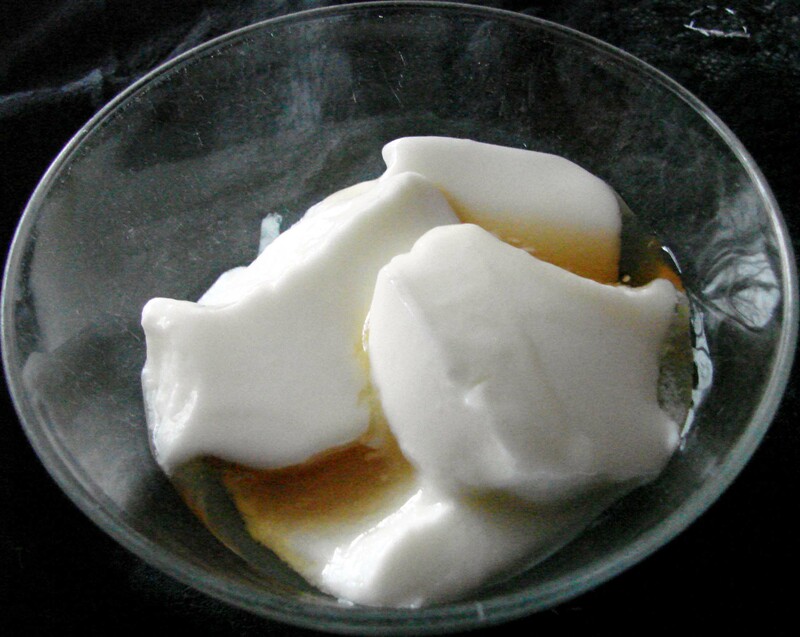 In a small bowl, mix the plain yogurt with the yogurt starter. Stir well. Put in the saucepan. Stir well. Pour in the yogurt maker by straining it. Follow the directive of your yogurt maker. When it’s ready (I let it in the yogurt maker near 10 hours), put it in the fridge for at least 4 hours. I like to add splenda and instant coffee that I sift so it’s easier to dissolve in the yogurt. Or I add splenda and 1 tablespoon of jam. Or just maple syrup on top mmmmm. I have a sweet tooth. I love anything sweet. If I could eat anything without gaining weigh, I’ll eat dessert at each meal. But since January 5th, I’m trying to eat healthier so that means cut down on the sweet treats. 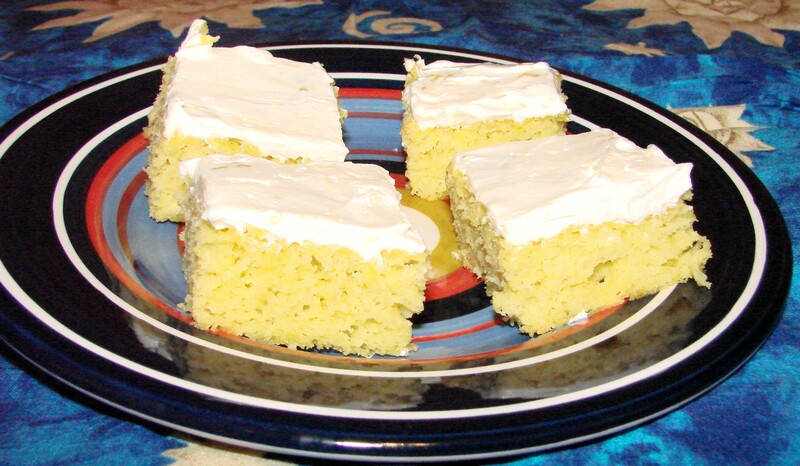 So here there are the famous lemon squares that have less than 100 calories each. I know the squares are small but it’s better than having none. And yesterday I had enough calories left, that I ate 2. I was so happy. Cake: In a bowl, with a mixer, beat butter until light. Add splenda and eggs, and beat for 1 minute. Add applesauce, lemon zest, vanilla and yellow food coloring and beat until mixture is homogeneous. In a bowl, mix flour, baking powder and salt. Add the dry ingredients to the butter mixture, folding delicately. Spread the dough in a greased 8 inches square pan. Cook in center of a preheated oven of 350 F for 15 minutes or until a toothpick inserted in the middle comes out clean. Put the pan on a rack and let cool. Icing: In a bowl, with a mixer (clean), beat cream cheese and splenda until creamy. Add lemon zest while beating. Spread the icing on the cold cake. Cut in 16 squares. Notes : you can add 2 tablespoon of ground flax seeds. This recipe can be doubled and put in freezer (without icing). On Sunday I made two soups. One for me and one for my boyfriend. 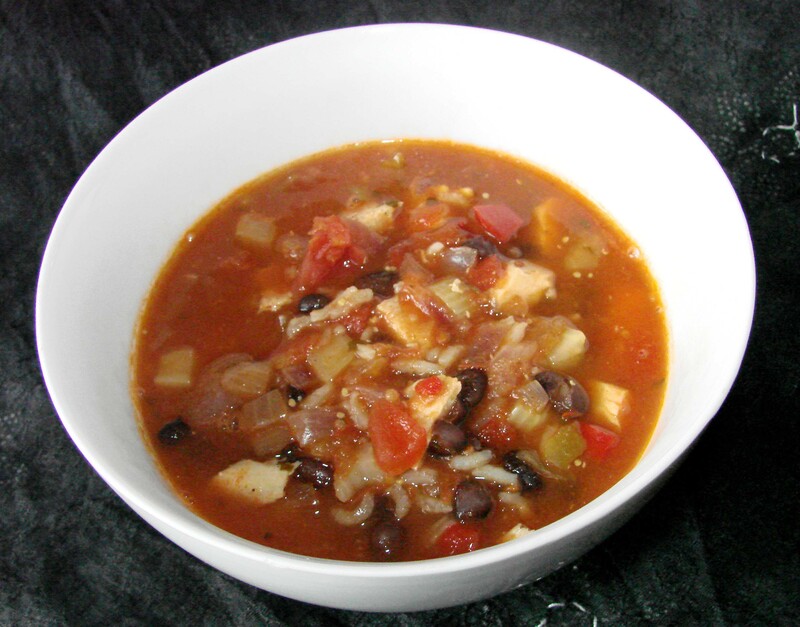 First let me present you the Black Bean Soup. My boyfriend says it’s spicy. I used a medium salsa. In a large saucepan, saute celery, onion and garlic in oil until tender. Stir in the remaining ingredients. Heat through. Diabetic Exchanges : 1 1/2 meat 1 starch. Now it’s time for my soup. In fact, in the description it’s mentionned that it’s more like a stew. On my photo, you can see that it looks like a soup. But now it’s really thick. I can almost eat it with a fork. I love the taste. It’s low in calories and there is plenty of fibers. I love it. Lentils are loaded with protein and fiber, can be kept on hand in the pantry, and cook quickly without presoaking, making lentil soup an excellent anytime meal. 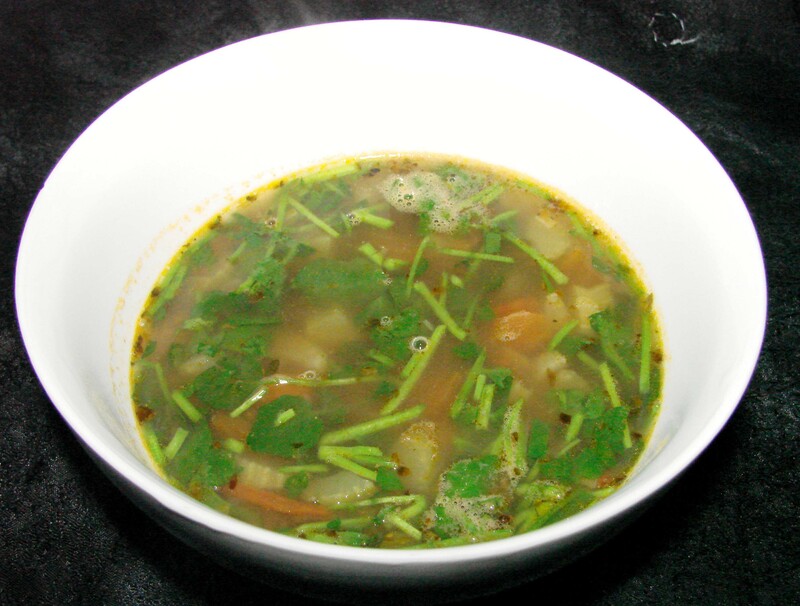 Peppery watercress perks up the flavor and adds vibrant color to this earthy soup. In a large saucepan, heat the oil over medium-high heat. Add the shallot and celery and sauté until the vegetables are tender, about 4 minutes. Add the tomato and oregano and cook for 3 minutes longer. Add the broth and 1 cup water and bring to a boil. Reduce the heat to medium-low and add the lentils. Return to a simmer and cook for 5 minutes, then add the bulgur. Simmer until the lentils are soft but still intact, about 10 minutes longer. Add more broth if necessary, but the soup should be slightly thickened like a stew. Remove from the heat and stir in the watercress. Season with the salt and serve immediately. Yesterday I had an amazing dinner. This chicken was in the marinade maybe 4 hours. Already, the smell was amazing. I knew it would be delicious. In shallow glass or plastic dish or resealable food-storage plastic bag, mix tomatoes, herbes de provence, oil, lemon juice, garlic and 1/2 teaspoon of the salt. 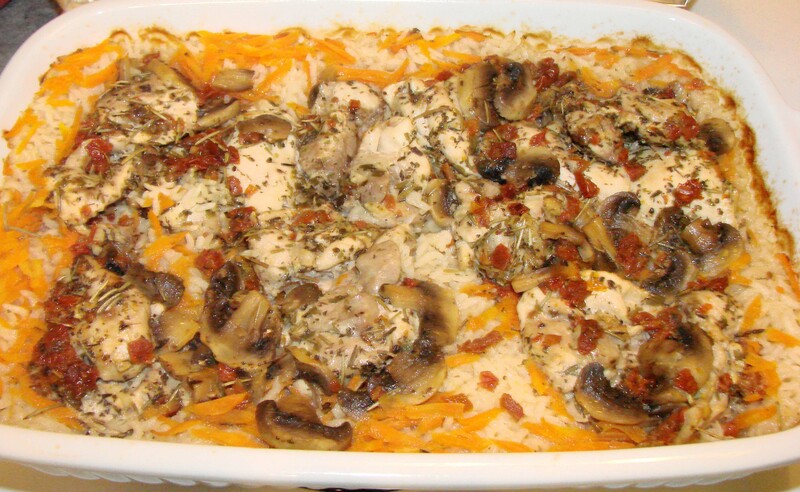 Add chicken and mushrooms; seal bag. 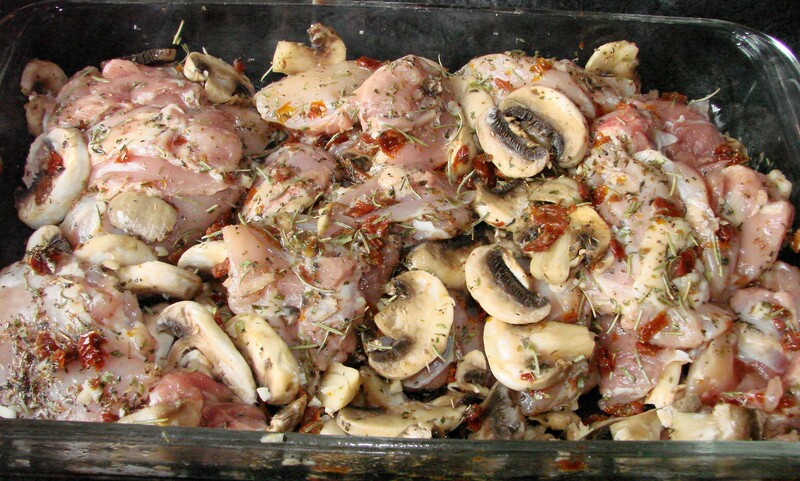 Turn to coat chicken and mushrooms in marinade. Refrigerate at least 2 hours but no longer than 24 hours. Heat oven to 375°F Spray a 13×9-inch (3-quart) glass baking dish with cooking spray. Place rice, carrot and remaining 1/2 teaspoon salt in baking dish; stir in boiling water. 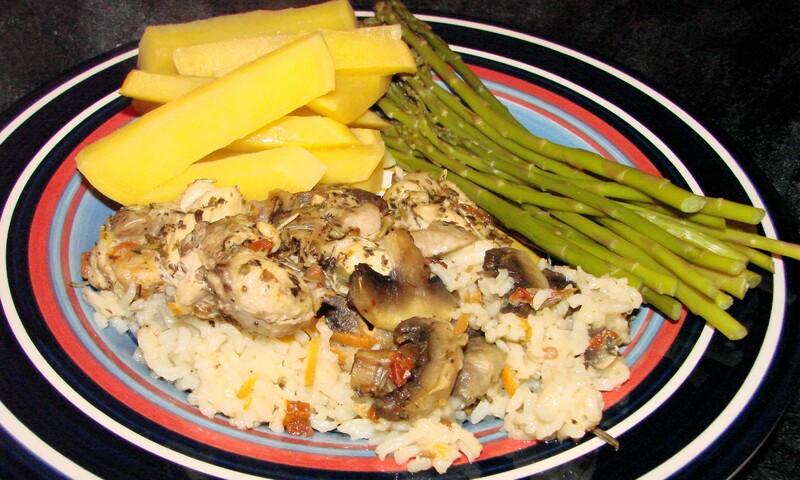 Place chicken, mushrooms and marinade evenly over rice mixture. Cover with foil. Bake 50 to 60 minutes or until liquid is absorbed and juice of chicken is clear when thickest part is cut to bone (180F). Sprinkle with parsley and lemon peel. Exchanges : 1 1/2 Starch, 2 Lean Meat, 1/2 Fat Carbohydrate Choices : 1 1/2. As you can see, I had a nice serving (and I didn’t eat it all), with steamed asparagus and rutabagas. It was so yummy. 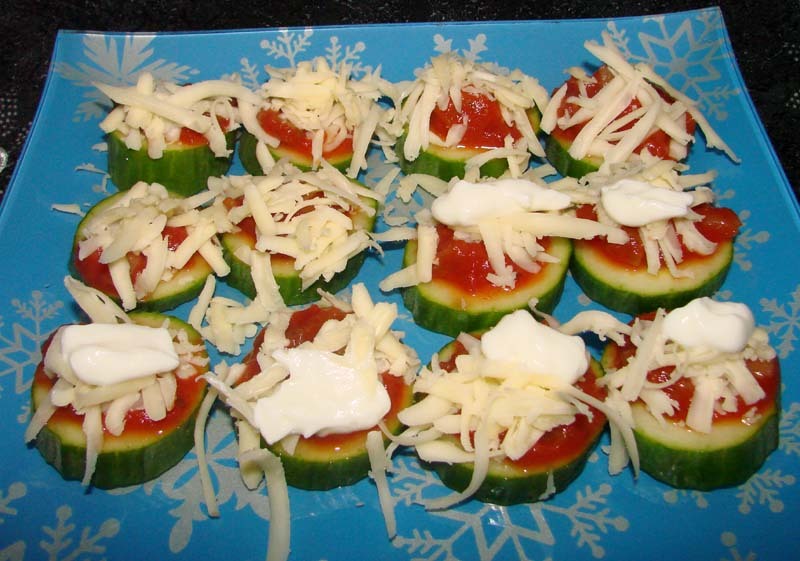 This is another winning recipe from Ricardo. Greens are good for our health? Then this soup is perfect. 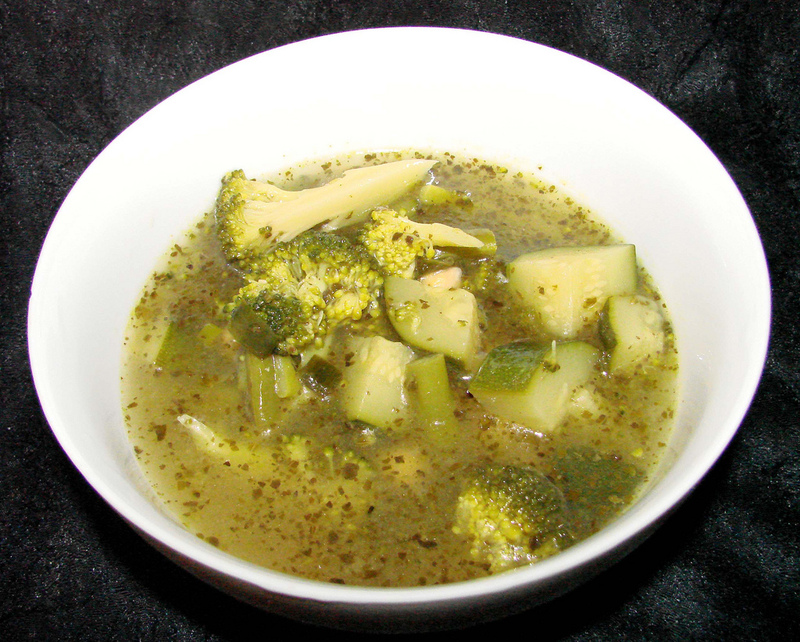 I don’t like broccoli but in this soup it’s yummy. This is very simple. For a complete meal Ricardo suggests to add chickpeas. Great idea! I love to bring soups for my lunch at work. But I need filling and low-cal soup. Sure I don’t eat only that. Today I had iceburg salad with raw chopped veggies (celery, carrots, green/red bell peppers), topped with italian dressing (5 cal/tablespoon). I had a big bowl of this salad. There is 2 tablespoon of pesto in this soup. It makes it so tasty. In a saucepan, brown the green beans in oil about 4 minutes at medium heat. Add remaining veggies and keep cooking 1 minute. Add chicken stock and pesto. Bring to boil and let simmer until the broccoli is tender, 2 to 3 minutes. Add pepper. Do you know Chop Soui? The thing I don’t like about Chop Soui is the bean sprouts. I don’t like the taste and weird I don’t like the way it looks LOL My mother made Chop Soui when I was young. I ate it but didn’t like. And then, older, when I was a teenager, I said no to it and ate something else. Maybe her recipe was not so great. I saw this recipe of Chop Soui in the magazine of Ricardo. I always love his recipes. I decided to try it but for my boyfriend. I tasted it. In fact, it’s the better Chop Soui I have ever tasted. But again, I leave it for him for his lunches of the week LOL I’m so generous 😀 And he’s happy. So everyone’s happy. That’s great! 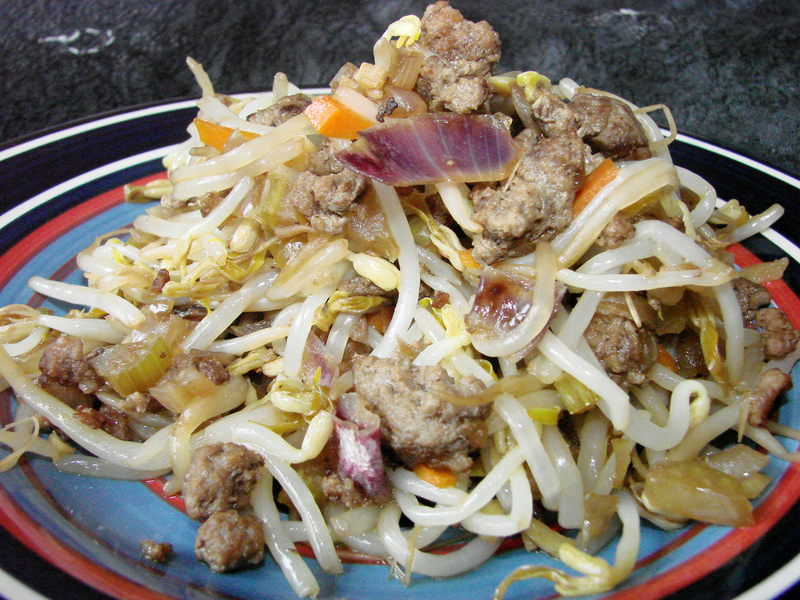 In a large skillet or a wok, stir-fry the onions, celery and carrot in half the oil until onion begins to brown. Add garlic and ginger. Stir-fry 1 minute. Remove from the skillet and set aside. In the same skillet, stir-fry the beef in remaining oil at high heat, breaking it until it’s completely cooked and cooking liquid has evaporated. Add the cooked veggies and bean sprouts. Add soy sauce and reheat well. Adjust seasoning.